1. 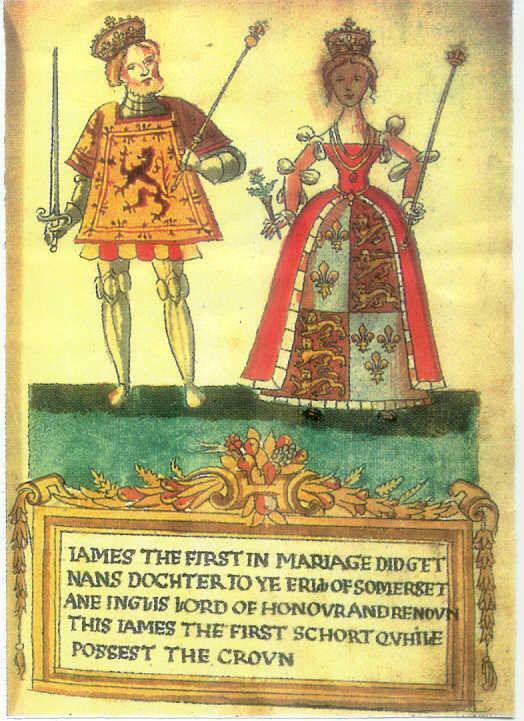 Sir James STEWART, son of John STEWART (c. 1350-1421) and Isabel MacDougall de Erqadia (c. 1362-1439), was born in 1383 in Innermeath, Argyllshire. He married Joan BEAUFORT on 21 September 1439. He died in 1451. 2. John STEWART, son of Sir Robert Stewart of Innermeath (of Durrisdeer), was born circa 1350. He had the title '1st Baron of Lorn and Innermeath'. He died in 1421. He married Isabel MacDougall de Erqadia. 4. Sir Robert Stewart of Innermeath (of Durrisdeer), son of Sir Sir James Stewart of Pearston (Periston), was born in 1325. He had the title 'Lord of Innermeath'. He died circa 1388. 5. Eion MacDougall, Lord of Lorn (also known as John MacAlan, Laird of Lorn), son of Alan de Erqadia, Laird of Lorn, was born circa 1328. He had the title 'Chief of Clan'. He married Joan ISAAC.